Calicinto has become the place for educational field trips. Over 2,000 kids experience life on the ranch. It fits well with the schools farm theme. 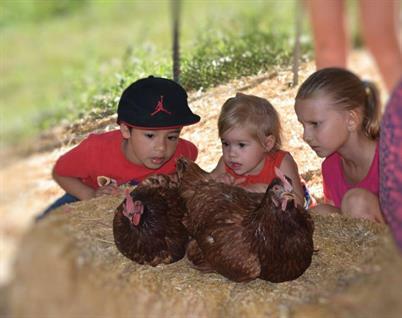 When the kids come out for the first time, they'll come out from 8:30 - 12 p.m. and you’ll experience a number of ranch activities like a hayride, pony rides, crafts, coloring, demonstrations, singing, that will build friendships and a day to remember. Memories that will last a lifetime. Year after year, teachers return to Calicinto Ranch with their kindergarten or first grade classes. We do offer preschool and additional elementary options. For many of the students, it is their first time experiencing a chicken. 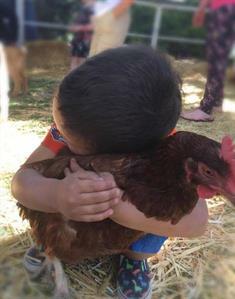 Seeing and touching a real chicken and they get to see where an egg really comes from. Some kids think that Stater Brothers makes the eggs, but they are able to see real life on the Ranch. The kids are able to interact with the animals like petting a pony, riding a pony, hands on with a number of animals in our petting corral.